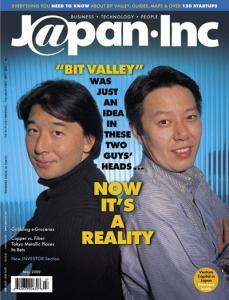 On the cover: Sonny Koike of Netyear (left) and Kiyoshi Nishikawa of Netyear. "This is not a boom, but a revolution. The Net has changed people's lives and business styles." Online grocers in the US still haven't bagged a profit, but that's not stopping iGrocer and others from bringing the idea to Japan -- where it's an even harder sell. It is called Bit Valley -- and it's Japan's equivalent of Silicon Valley. The PlayStation2 -- It's a Hit! Haven't we heard enough about the PS2's amazing and society-changing capabilities? Here's some PS2 trivia instead. The Japanese are still getting used to the idea of credit and debit cards, but plastic is definitely on the rise. Japanese shoppers have suffered the highest prices on just about everything for years, but now they're turning to online auctions to find bargains. "Shmr" got ripped off in a Net auction. And then he fought back. A quick look at what Japanese surfers are searching for online reveals some pretty weird stuff. First he helped force NTT to let ADSL run over its networks. Now the CEO of Tokyo Metallic Communications has a slew of other hurdles to clear. He says he's the luckiest entrepreneur in Japan. His company ProTrade is one of the first graduates of the Entrepreneur in Residence program at NetAge. Is he a startup or just some guy with a website? What difference does it make? If you're new to trading Japanese stocks, Gaijininvestor.com could be a lifesaver. A lot of his friends had great ideas but no funding, so this new media writer transformed himself into a Net venture dealmaker by launching Startup Forum. Why -- oh why -- does the CEO of InterBusiness, an e-commerce consultancy for US and Japanese companies, refuse to buy our intern a Porsche? In this "land grab" era of Net growth, we have a unique opportunity to be both extremely successful and generous. Japan's future billionaires don't have much use for traditional zaibatsu banks. They can deal instead with digital institutions anywhere around the world. Today's Tokyo may be heaven for an Internet entrepreneur looking for money, but if this is heaven, where are the angels? The Japanese Language Meets the Net. Mobile phones are starting to outnumber fixed lines in Japan. Technoweb, an ASP, targets Japan's education providers. OneWorld plans to let companies easily update their multilingual websites. PBClub has a found a comfortable in niche in B&Bs, not B2B. Tokyo IPO's site helps investors get in early on Japan's IPOs -- in English, even. Cisco Japan will probably rumble in its Nasdaq Japan debut next month, but don't double count on it. A look at Crayfish, an email service hosting provider that was third to go public on Mothers. Briefly, how to invest in Japanese stocks. Counting stars? There's nothing to it -- as shown by Tatsuo Miyajima's current Tokyo Opera City exhibit. Stir crazy. As of the end of 1998, there were some 2,838 foreigners doing time in Japan, roughly double that of a decade ago. Now the Asahi Shimbun reports Japan may become the first country in Asia to adopt a multilateral arrangement, already widely adopted in Europe and the US, in which foreigners convicted of criminal offenses serve out their sentences in their own country. Since only about 80 Japanese are incarcerated abroad, this may develop into yet another dumping issue.